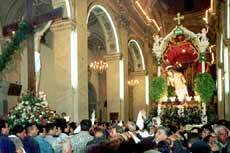 The procession of the Holy Friday, one of the religious manifestations more complex and archaic, recurs every year. The tortuous streets of Bronte that become a big stage in which, with intense, deeply felt religiosity, is played the Passion and the Death of Christ. Always intense and spontaneous is the collective participation supported by strong emotions and religious feelings. It dates back to past centuries but traditionally it is still and always lived with the mind concentrated on the religious drama, with the intense and sponta­neous collective participation, accompanied by strong emotions and a deep Christian feeling. The Brontesi and the numerous strangers who gather together along the main course and in the other streets covered by the procession, relive each year with religiousness and emotion always new emotions and inner situations. Already from the morning, rigorous to an old popular proverb (“u vènniri non si canta canzùni, ca si pensa a la motti e a la passiùni”) everywhere is silence, do not sing and do not laugh, the bells do not ring because they were « related »on Thursday. 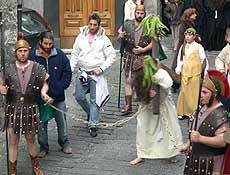 As a sign of sadness, only the woody sound of the "tròccola" (photo on the right) and the drums can be heard. In the first afternoon of every Holy Friday, the narrow country town streets get slowly crowded with believers that in bare feet carry candles, ancient confraternities with their flags (black edged) and the crucifixes adorned with the first fruits of the earth, of statues representing the passion of Christ, of altar boys, of figures and personages, singles or in groups, everyone with a precise part to play. With the same devotion and the faith of every year, the procession goes on with a centuries old direction and itinerary that, except some very small adjustment, have been handed down by our ancestors. at four o'clock P.M. from the church of Madonna del Riparo with the exit of Christ burdened on the cross. A little further, in the Capuchin Church, joins in the urn with the Christ Dead, followed by the confraternity of the Third Order of San Francesco (founded in the year 1863). 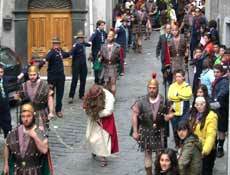 Along Corso Umberto join the procession from San Silvestro's church, the confra­ternity of Maria SS. della Misericordia (instituted in the far 1616) and, from the Church of Maria SS. della Catena, that of S. Carlo Borromeo. Gradually the participation of the devout believers and of the personages becomes ever larger. In a following one another of parts of an only act, in every church a new multitude joins the procession, that become at the end the complete representation of the passion of Christ. About one hour after starting, in front of the Church of Matrice, get into the proces­sion the statue of the Madonna Addolorata, the various personages of the passion and the confraternity of the SS. 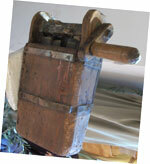 Sacramento (one of the more ancient, about 1600). The procession proceeds till Gagini square: from the church of the Annunciated with the statue of Christ tied to the Column and the confraternity of Jesus and Mary (1700). Everyone plays with fervor and devotion his own part and, among the crowd and the waving of the statues, the getting on is slow and hard through the narrow streets of the ancient quarters of Bronte. 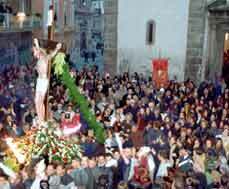 The procession winds in the streets of the inner center going on again, in the tortuous and narrow little streets of Bronte, with a sequence of scenes, of symbols and of religious representations, all the more dramatic moments of Christ's passion. Veiled and white dressed young girls carry and show all the symbols of the passion (the chalice, the cross, the nails, the sponge, the step ladder, the spear …). A saint Michael Archangel proceeds slowly, at rhythmic step, beaten by the monotonous rhythm of a drum. 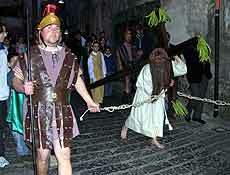 It is represented Christ tied and dragged by the violence of the Roman soldiers, Christ, bent down, carrying the cross helped by the small Cireneo, the blows of the soldiers. In religious silence the three "pious women" walk with the face covered by long hair, the Apostles (excluded Judas), the local clergy, all the authorities, the confraternities and the associations and all the people of Bronte. 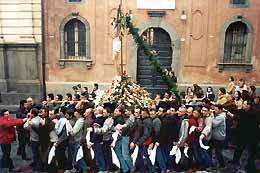 The sacred images, adorned with flowers, with the first fruit of the season, stay over long wooden poles and are carried on the shoulders by hundreds of believers, (many come back on purpose to Bronte for this traditional devotion). The crowd of believers that follow every single statue, (many of them bare feet) interrupts the passing, one after another of the scenes: (Christ to the column, the Crucifix, the urn with the body, the Grieved Lady), giving some pause to the intense emotion that touches everybody's hearth. The religious silence and the prayers are interrupted by the shouts of the persons that carry on their shoulders the statues: under the Christ to the Column or the Addolorata (Grieved Lady) there are over eighty people, with no shoes, tightly pressed one against the other, carrying the sacred images. The statue. The religious silence and the prayers are inter­rupted by the shouts of the persons that carry on their shoulders the statues. The narrow streets of the village and slowly popu­late faithful who barefoot carry the candles, ancient bro­ther­hoods with their banners (mour­ning) and crucifixes adorned with the first fruits of the earth, altar boys, a statue representing the passion of Christ , extras and characters, individuals or groups, each with a precise part to play. A saint Michael Archangel proceeds slowly, at rhythmic step, beaten by the monotonous rhythm of a drum. – "E chiamammura ccu veru cori!" (and let's call her with our true heart). – "Viva a misericordia di Diu!" nearly competing to whom can shout louder to honor Christ and the Madonna. The procession pauses in Piazza Spedalieri (Spedalieri square, the place of all civic feasts and manifestations ) where the statues meet, are aligned and put on trestles. The bearers, the devout actors that represent Christ find a moment's rest in their huge exertion. Then everybody starts again to go along Corso Umberto for the return. The statue of Christ to the Column shown in natural size and the Christ with his hands tied behind his back to a column. The tradition says that it was made by a brontese shepherd. The statue is preserved in the church of SS. Trinità (Matrice). happens in the Matrice church (SS. 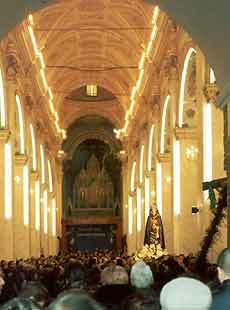 Trinità) when, among the overflowing that fills every corner of the church, the statues Christ to the column and of the Grieved Lady meet in the nave of the church, while is heard, among the invocations of the devout carriers under the statues, the traditional song "Stabat Mater". During the re-entry of the statues in the various churches, towards midnight, is also touching the stop of the Crucifix and of the Dead Christ in front of the Catena church, with the sad singing of the traditional "Popule meus". Unfortunately, the traditional poly vocal repertory of the Holy week is gradually becoming ever poorer. Without the natural rotation of elderly voices with those of younger generations has been irremediably lost. It is a grave cultural loss; the young generations have not been able to pick up and keep a tradition handed down to us by our ancestors in the course of centuries. Having failed, in fact, in these last two years, the group of elderly cantors (of the confraternity of the SS. Sacramento) that followed the procession and in the precise ritual moment of the itinerary, started to chant the so called "laments". Were suggestive chants completely incomprehensible because of the many transformations that the words have undergone since. 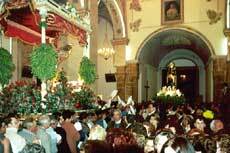 They used to recall ancient verses of the "Vassillo", of the "Via Crucis" and of the "Stabat Mater" ("Batti e ‘Mmatri"). 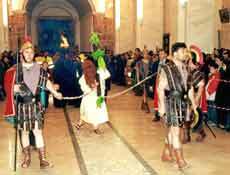 It has also failed, but for some years before the Second World War, the representation of Christ called "Ecce Homo" with the participation in the procession of the penitents of the Flagellant Company, linked to the altar of Christ at the Column. 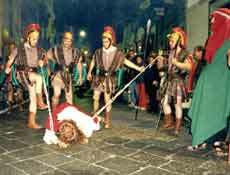 Christ was stripped of his clothes and covered with a red cloak followed by the "flagellanti" or public penitents who, during the procession, beat their shoulders to the blood with chains. Penance was practiced for about seven years to be freed from the seven deadly sins and hence from eternal damnation. 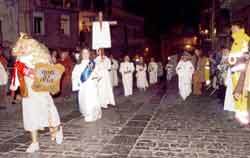 Until 2003, the procession, after having covered the Umberto cour­se, returned in the evening to the church of the Matrix (Holy Trinity) and here, in an impressive crowd of believers, the sacred repre­sentation reached its climax and most exciting moment: in the middle of a crowd overflowing the statues entered the church and crossed in the great central nave simulated the evangelical encounter between Jesus and his Mother on the way to the cross. For obvious security reasons, since 2004 the tradition has disap­peared: among the incredulity of all "the meeting" was moved first in Piazza Spedalieri and from 2009, at the end of the procession, in the square in front of the Santuario dell'Annunziata. In the photos below, the last "meeting" in the church of the Matrix between indescribable chaos.